Show me a map to get to Lodi! Click on the map below to see where the show is on the fairgrounds. The Lodi Grape Festival Grounds is located in San Joaquin County on Highway 99 just north of Highway 12. Guess what? About a stones throw from the Golden State Pinball Festival lies an RV park. We like to refer to it as Camp Silverball. Click on fairgrounds map to the right to see proximity. 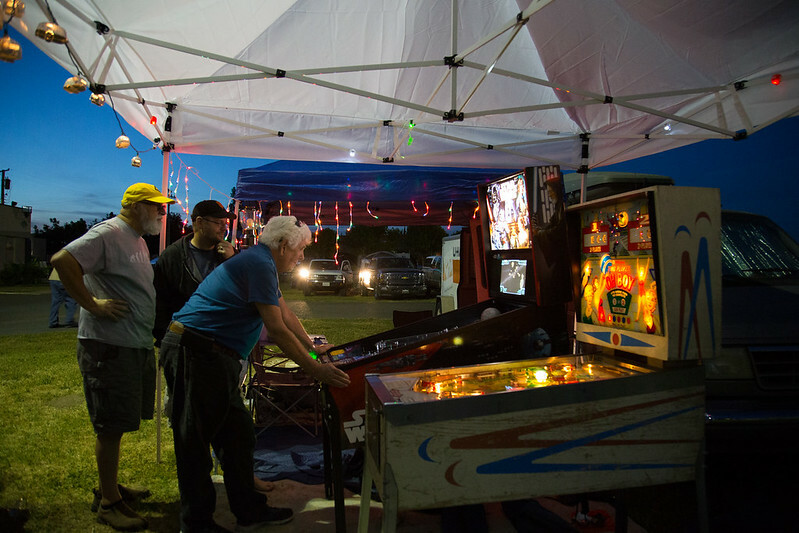 Imagine spending the weekend with a bunch of like-minded pinball enthusiasts right outside the doors of the Golden State Pinball Festival! Why the possibilities are endless! Q: How many sites are available? A: We have 40+ sites available! Q: Can I reserve a spot? A: We no longer have any open spots available. Please contact us here and we will add you to a waiting list in case of cancellation. There is an offsite alternative only 10 miles away, near the I-5 corridor, called Flag City RV Resort that is an RV only campground (sorry, no tents). You can find more information on their website here. Q: Do you still have open spots left? A: [UPDATE] We are sold out! As long as the registration form is available, there are sites available. However, there is no guarantee that the remaining sites will fit your RV. We will contact you if your RV is unable to fit in any of the remaining sites. Q: How do I select a site? A: Sites are automatically assigned based on your RV’s size and availability. Selecting your own site is not on option at this time. Q: Can I camp in a tent? A: Yes, we have have limited Tent Sites available (provided the reservations are still open). Q: What is the cost per night? A: $30/night if you pre-register or $35/night at the door (for RV spaces). The cost for Tent Sites is $25/night. Q: How do I pay for my campsite? A: If you pre-register, you will pay online with a credit card. If you are not pre-registering and hoping a site is available and fits when you show up, we will collect upon check-in via credit card. A: When you pre-register, we will send you an invoice that you can pay via credit card online. This will be non-refundable. Give us up to 48 hours to invoice you once you submit your reservation request. We highly suggest pre-registration as we expect these sites to go fast! Q: What’s an invoice, how do I pay it, and when? A: You will be sent an email and be directed to a secure, online web page that will allow you to enter your payment information. We will need your response within 48 hours in order to hold your site. Unfortunately, at this time, if you don’t have access to email or credit card, there will be no way to reserve a campsite. Q: I want to camp next to a friend, can we arrange sites together? A: Please contact us here and we will do our best based on what’s available. Please be patient and we will try to be as responsive as possible. Q: What comes with the site? A: Water and electricity only. The facility doesn’t have picnic tables, fire rings, or sewer connections. Q: Where can I dump my grey and black tanks? A: There is a dump station available on-site, dump fees are included in your camp fee. A: Unfortunately, fires are not allowed. A: Yes, put please keep them on leashes when outside and pick up after them. Q: Are there Restrooms and Showers available? A: Yes. Restrooms and Coin-op showers are available within the Campground. Q: When can I check-in and how long can I stay? A: You may check-in as early as noon on Thursday and must check out no later than noon on Monday. Learn about other places to stay nearby on the "FAQs" page.